A versatile, high-performance bandaging tape for a broad spectrum of applications – support, compression, catheter and bandage secural. Layers "bond" together to provide superior support bandages that stay put. Bandage sticks to itself (but not to fur). Features: conforms around contours that are difficult to bandage, immobilize limbs for splints and casts, provides support for sprains and strains, support post-cast removal, protection and bandage security, allows skin to breathe through cool, lightweight, porous material, and absorbs virtually no moisture. 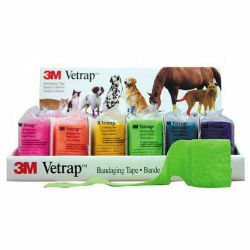 Ideal over-wrap for absorbent padding or poultice pad. Maintains even compression over time. Easy to apply, reposition, and remove, Now even easier to use with Hand Tear Technology that provides clean, straight tearing. 4” x 5 yard is sold in a pack of 24.